How will the Russell Wilson situation play out in Seattle? Former Super Bowl winner Russell Wilson made headlines on Tuesday with reports that he’s set a deadline for a contract extension from the Seattle Seahawks. This has apparently been simmering behind the scenes for some time now. Entering the final season of a four-year, $87.6 million extension he signed with Seattle back in July of 2015, Wilson is obviously underpaid. He wants a raise and long-term job security. For their part, the Seahawks have been hesitant to hand aging veterans long-term deals. Whether that changes at the quarterback position remains to be seen. But here’s how the entire situation could play out over the next several weeks. A line in the sand: Seattle’s history is not beneficial to Wilson taking team hostage. Both Earl Thomas and Richard Sherman exited Seattle over the past calendar year plus after failing to obtain extensions from the team. This could very well be a blueprint for the Seahawks moving forward. Just how much does general manager John Schneider and Co. value the quarterback position? Seattle would more than likely have to bite the bullet to extend Wilson. That includes $30-plus million annually over four or five seasons. A trade could make sense: Wilson would net the Seahawks a huge return. It’s been decades since a franchise quarterback at the height of his career has been placed on the trade block. Regardless of whether Wilson is on the block, Seattle could net an absolutely huge return for him in a trade. Linked to the New York Giants, the starting-off point there would be New York’s first-round picks in the 2019 NFL Draft (sixth and 17th overall). That’s just a barometer of what Seattle would be looking at as a sell-low return. The team won’t sell low. Potential interested teams: Some limitations in a trade. We mentioned the Giants as a potential landing spot should Seattle entertain trade offers for Wilson. However, it’s more than likely that the team would want to move Wilson to the AFC. That does narrow the competition for Wilson’s services to an extent. It’s similar to the Jimmy Garoppolo situation in New England a couple years back. If we’re looking at the AFC, the Oakland Raiders and Miami Dolphins become obvious choices. Oakland has three first-round picks this year and two more next year. Derek Carr could also be leveraged as bait. In the end: Expect Wilson and the Seahawks to come to terms. There’s a reason why franchise quarterbacks in the height of their careers are not traded. Wilson has been a legit MVP candidate over the past several seasons. We’re expecting the two sides to come to terms on a deal ahead of the NFL Draft. That timeline makes the most sense given Wilson’s demands. 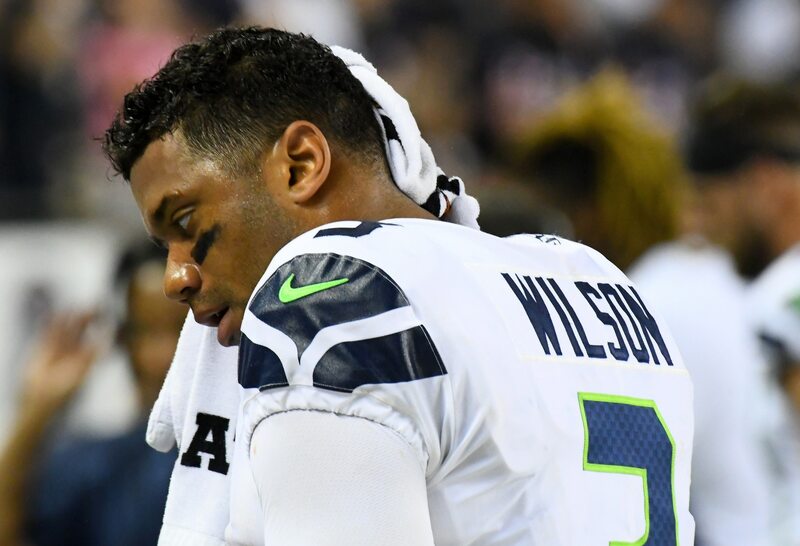 Looking at market inflation and how the quarterback market has reset itself multiple times recently, Wilson is in line for $120-plus million over four seasons.